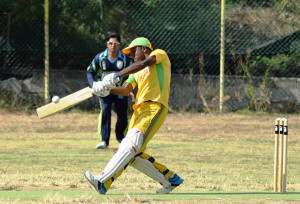 Grenada, championships of the present, began defense of its BVI Cricket Association LIME Twenty 20 League title on Sundayafternoon in Greenland, with a 76-run victory over former champs Cavaliers, who have won more T20 titles than any other team, as both teams opened their Premier Division encounter. Grenada used Derol Redhead’s well constructed 94 after deciding to bat after winning the toss, as he and Raymond Charles (28) put on 112 for the 3rd wicket. Redhead tally included 6 sixes and 13 boundaries. Bryan Daley added another timely 30, as the defending champs posted 209 for 5. Christanand Dhanpaul, Aaron Baker, Mohammed Hasan, Vishal Bharat and Jagnarine Persaud all picked up a wicket each for Cavaliers. The Cavaliers, looking nothing like the revered squad from the past, despite the loss of wickets at regular intervals, they managed to keep up with the required run rate, until Bharat fell cheaply for 49. Teddy Nankishore scored 26 and Baker a supporting 23 at the top of the innings. However, with Francis Kitason snatching 4 for 41, Trent Belfon, 2 for 25 and Rodney Marryshow, 2 for 40, Grenada bowled out Cavaliers inside 15 overs, for 133. In Division One, Under the Tree flogged the Wolues by 10 wickets after bowling their opposition out for just 127. The Wolues who batted first were comfortable in reaching 46 without loss, as Jadid Khan (19) and Vance Lewis (17) had solid knocks off the Under the Tree bowlers. However, the introduction of Travis Jack was a different story as he began ploughing through the line up. Jack finished with 3 for 7, removing both openers on the way and from there, on in only Daniel Singh with 34 and Jerome Pereira, 17, offered any semblance of resistance. Under The Tree’s Rudolph Davis picked up 2 for 23 and Colin Olivierre, 2 for 24 to conclude the innings. In reply the Wolues tried everything they could to restrict Under the Tree batsman, Olivierre and Kevin Thompson, contributing to their own demises as they let several chances get away, before the pair picked off the runs for a comfortable victory. Olivierre finished unbeaten on 59 with 4 sixes and 7 fours, while Thompson was unbeaten on 46 also with 4 sixes and 3 fours. On Sunday, Vincy will take on the Royal Knights at 10.00 a.m. and and at 2.00pm, Virgin Gorda will face Road Town Wholesale.